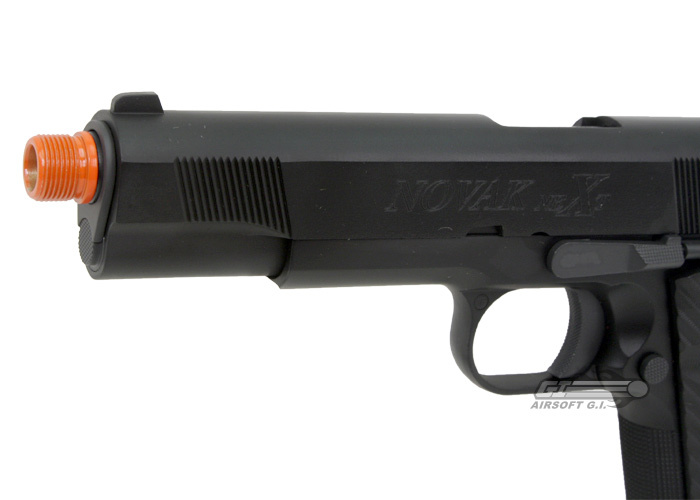 The SOCOM Gear Full Metal NOVAK NeXt 1911 Airsoft Gun is a mixture of a classic M1911 with modern day upgrades. On the end of the barrel is a 14mm counter clockwise threaded adaptor, you can give this gun a Special Operations look with a barrel extension. 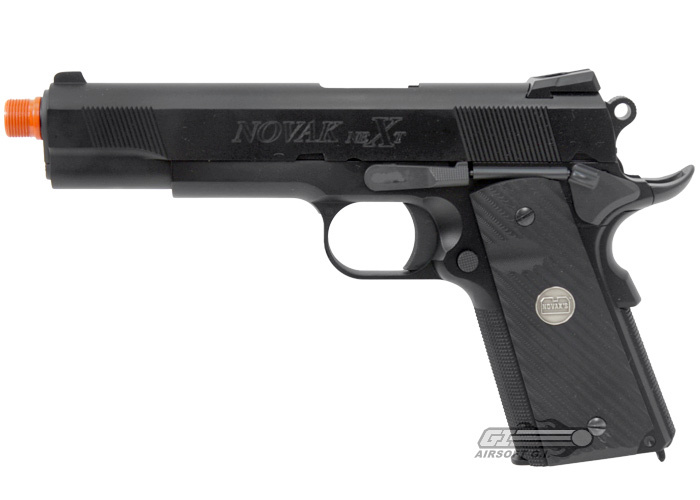 The Novak brand name and emblem are all over the slide and grips, just like the real gun counterpart. 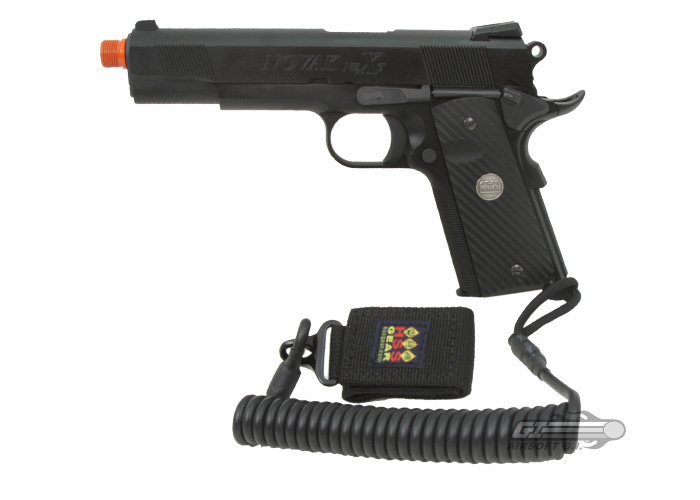 The solid trigger and small safety lever look as if they were taken from the classic M1911 design. 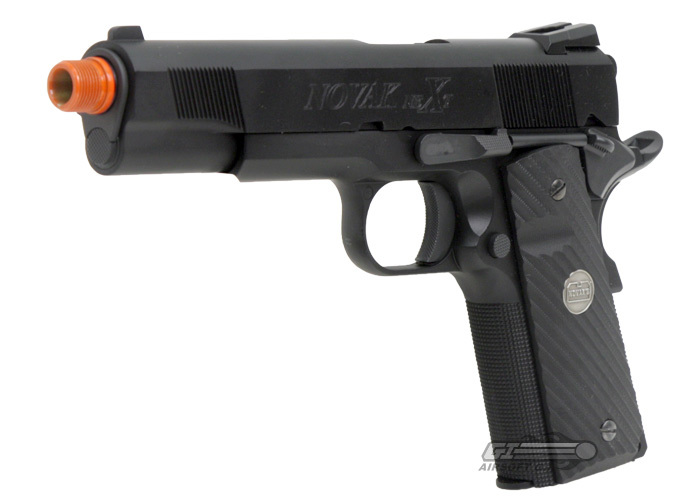 The drilled hammer and Novak style sights are a resemblance of more modern 1911's. This gun also features a grip safety and beaver tail. Additionally SOCOM Gear has included a HSS Pistol Lanyard to keep the gun safely secured to your gear. 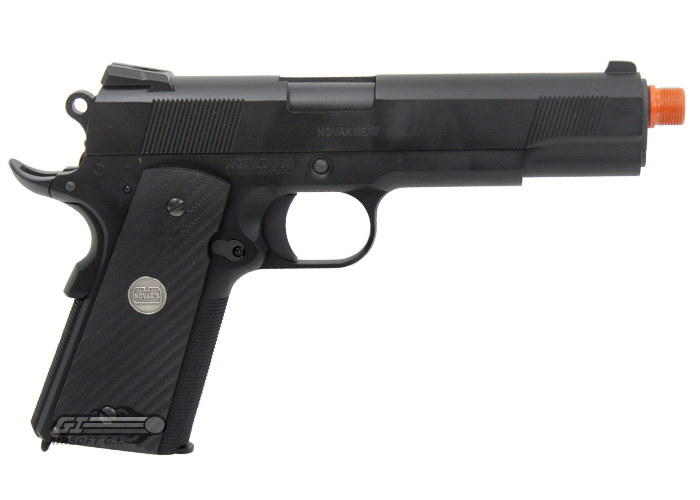 This is yet another excellent quality gas blow back pistol from SOCOM Gear. My first GBB Pistol and I am loving it. The WE Magazine that came with this doesn't leak, but the little plastic slide on the side broke so that prevents the magazine to stop the slide back when its out of BBs and I can't pull the little slide down to easily load BBs anymore. I also bought a silver WE 15 rd single stack magazine at the same time i purchased the gun and that magazine leaks, had the plastic peice also break, and the bottom of the magazine has a gap and its wobbly. This gun looks and feels amazing. The full metal construction is sturdy and it looks great. Carry bag didn't come with mine. I have the two tone version of this pistol that has been discontinued. My pistol came with bag/case instead of a lanyard. The pistol is sturdy and has decent blowback. The efficiency is decent for a 1911. My efficiency doubled after cleaning it for the first time. After cleaning I could go through about 25 rounds per gas fill. 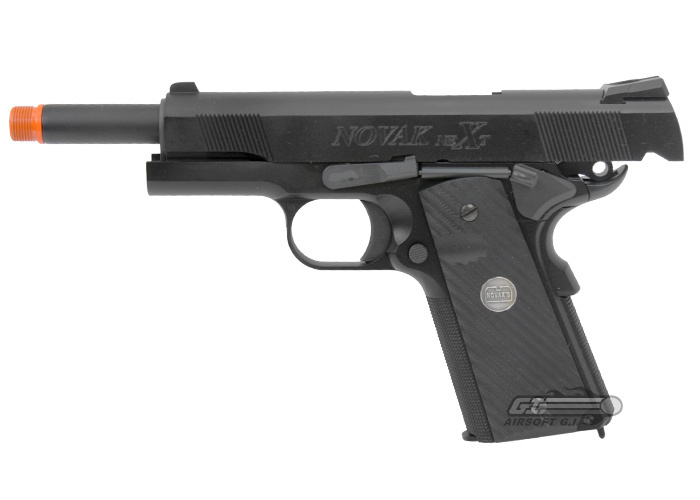 The NOVAK styled sights are great and so are all the NOVAK trademarks. 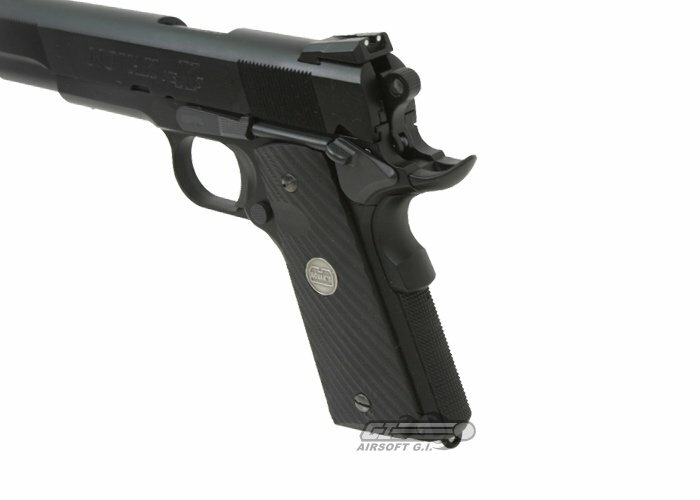 rest is similar to the standard 1911 except for the drilled hammer. The orange tip can be removed with some difficulty and replaced with the included threaded outer barrel. It's accurate and powerful and trusty. Just make sure to clean it occasionally.